Our new online Configurator tool, known as DTools, has been expanded to include the company’s latest conveyor platform – the 2200 Series Precision Move. DTools is a group of online tools designed to help users select, design, configure and apply conveyors. The Configurator is an intuitive 2D and 3D CAD platform that allows users to build complete conveyor assemblies to their exact layout dimensions. The addition of the 2200 Series Precision Move means users can now utilize the Configurator to build assemblies of the new conveyor platform, as well as Precision Move gang, slave and common drive versions. Gang drive belt conveyors allow one gearmotor to drive multiple conveyors, side-by-side, at the same speed with positively driven belting. Slave drive belt conveyors allow multiple conveyors to be linked together end-to-end with one drive, and common drive belt conveyors allows multiple conveyors with different lengths and widths to operate them as one unit side-by-side with a single drive motor. The Configurator is engineered with tool guides and uses conveyor logic to only place applicable matching conveyor components together; if a system can?t be designed and built for actual use, the Configurator will not design it. This intuitive feature saves user’s time by alerting them of an erroneous design, allowing them to make the necessary adjustments before proceeding. When the Configurator design is complete, customers receive part numbers and detailed descriptions of all the components in the build, information to receive a quote, along with the CAD and 3D PDF files. 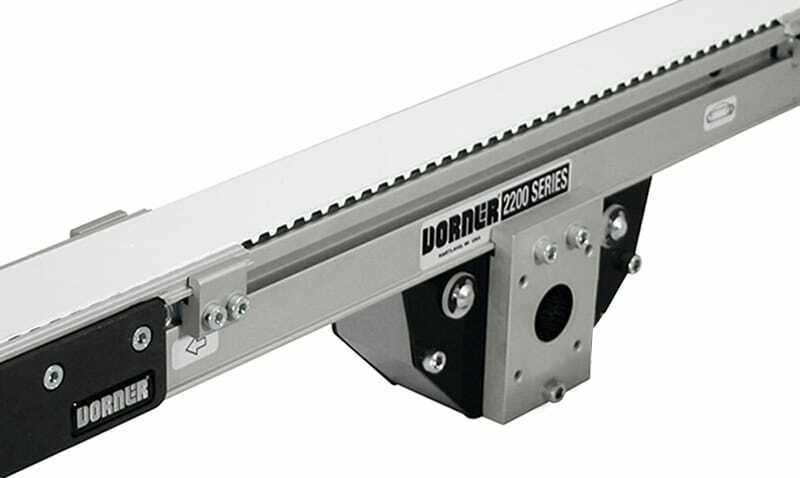 Precision Move represents the latest in timing belting and drive technology from Dorner for its 2200 and 3200 Series low profile belt conveyors. The offering is ideal for the assembly, manufacturing and packaging industries that call for extremely accurate movement of product at specific times, distances and intervals.